It has been awhile since we shared any updates on our home renovation. Although things have significantly slowed down around here (at least when it comes to manual labor), I thought it might be nice to share a few room reveals. We are not completely finished with our original interior renovation plans, but the remaining items are minor and unnoticeable to most. 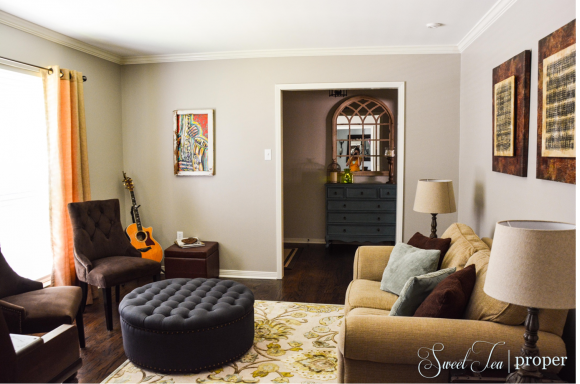 The formal living room is where the renovations started months ago. Here is the “before”. I wish I had taken better photos of the house prior to making any changes. Unfortunately, we had to go with a few snapshots we had taken with our phones and the realtor photos. We learned how to take down popcorn ceilings in this room and then continued throughout the rest of the house. 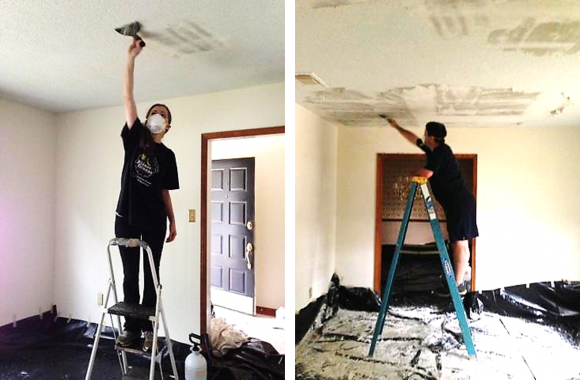 Once the popcorn ceilings were down, we sanded and painted the ceilings for a smooth finish. 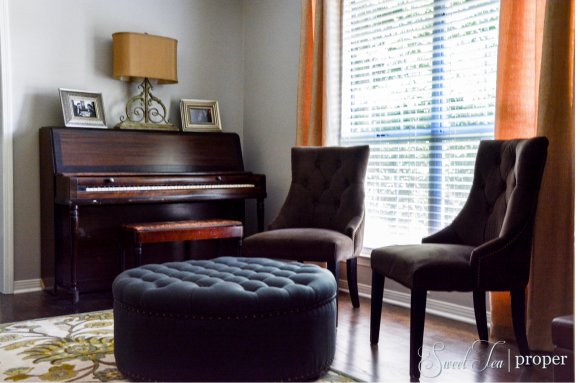 This room is the home to our piano so a “music theme” naturally took place. For now, Mr. P keeps his favorite guitar on a stand in one of the corners. However, once Cecilia becomes more mobile we will probably have to find another place to store it. We purchased a beautiful rug from Home Depot (Artistic Weavers Lauren Ivory), trunk side tables from Overstock.com (Journey Vintage Tobacco Leather Trunk Side Table), gray “antique” lamp base with a burlap shade from World Market, and a blueish-gray round tufted ottoman from Wayfair. *These links are good as of the writing of this article, but may change or become unavailable in the future. 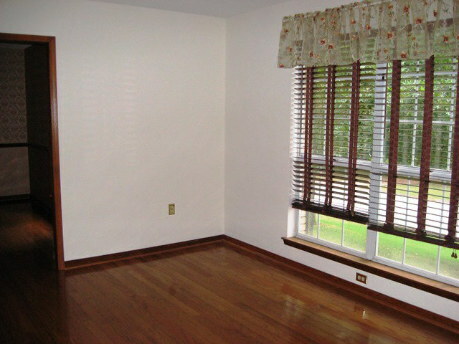 We already had the rest of the furniture and decor for this room so the overall cost of the upgrade was minimal. I love the New Orleans inspired art piece above the guitar. 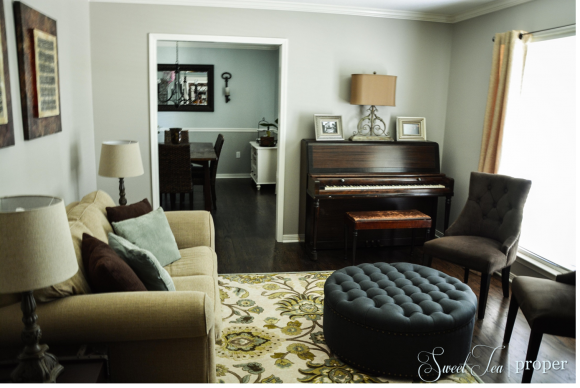 It worked perfectly with the music theme and added a much-needed pop of color to the gray walls. 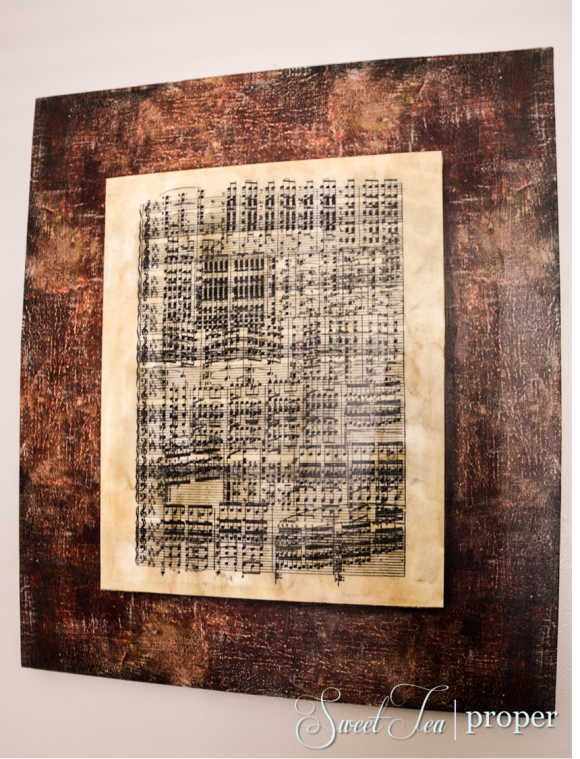 Above the loveseat you might have noticed one of our previously posted projects – DIY Sheet Music Canvas Art. 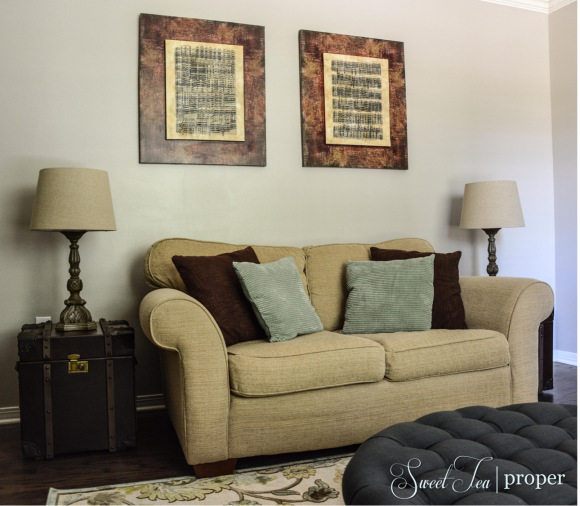 These pieces are one of my favorite DIY projects and an inexpensive way to change-up the room without the unnecessary cost of purchasing something new. 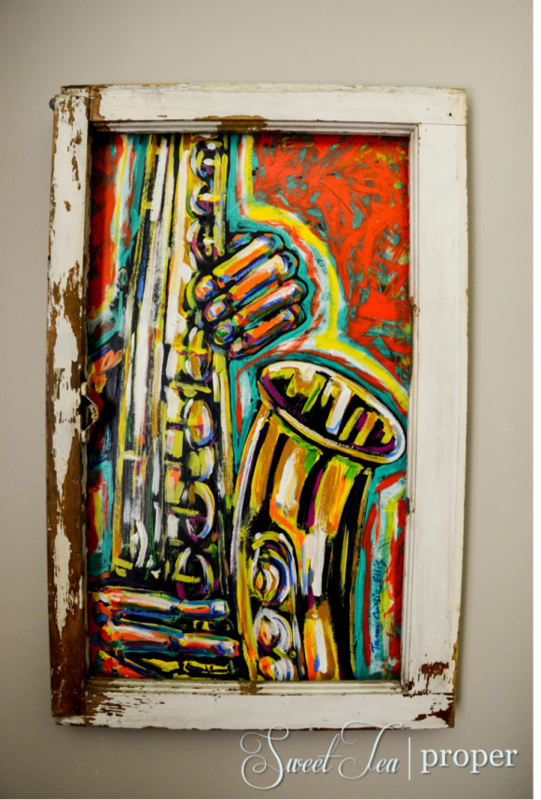 If you have a “music room” or are a music enthusiast, you might be interested in this creative and unique decor piece. My brother is quite talented with a scroll saw and he gave Mr. P this large wood pick with the Led Zeppelin logo as a gift. It can be hung on the wall or laid out. We hope you enjoyed our first room reveal! Check back soon to see more of our completed home renovation.